You’ve had some success at Las Vegas Motor Speedway, no wins yet, but some great runs. What is it about the track that suits your driving style? Chassis Chatter… The No. 88 ThorSport Racing team will unload chassis No. 54 for Saturday night’s DC Solar 350 at Las Vegas Motor Speedway (LVMS). This is the same chassis Crafton piloted to his first win of the 2016 season at Charlotte Motor Speedway, and two runner-up finishes at Kansas Speedway, and Texas Motor Speedway earlier this season. Most recently, the ThorSport Racing driver finished seventh with this chassis at Michigan International Speedway. In four starts in 2016, this chassis has led the field for 260 laps. In the Ring… Crafton will join the other seven Chase drivers on Friday, September 30, at The Ultimate Fighter Gym in Las Vegas, to go through basic training with UFC Fighter, Kevin Lee. Lee, known as, “The Motown Phenom,” is 24-years-old and has a fight record of 13-2-0 (W-L-D). Intermediate Track Stats… No current NASCAR Camping World Truck Series (NCWTS) driver is better at Intermediate tracks than Crafton. Dating back to 2014, Crafton has finished in the top-10 in 20 of the last 23 races at ovals measuring 1.5 or 1.54 miles. Included in that stretch are seven wins, and five runner-up finishes. Las Vegas Odds… Among active NCWTS drivers, Crafton has the Most Starts (15), the Most Top-Five Finishes (6), the Most Top-10 Finishes (10), has completed the Most Laps (2132), and has the Most Lead Lap Finishes (11) of any other driver entered in Saturday’s event. In The Loop – Las Vegas… According to NASCAR’s Loop Data Statistics, Crafton ranks first in Laps in the Top 15 (1395) and Laps Led (128), second in Fastest Laps Run (81), fifth in Driver Rating (100.9), and seventh in Average Running Position (8.6). 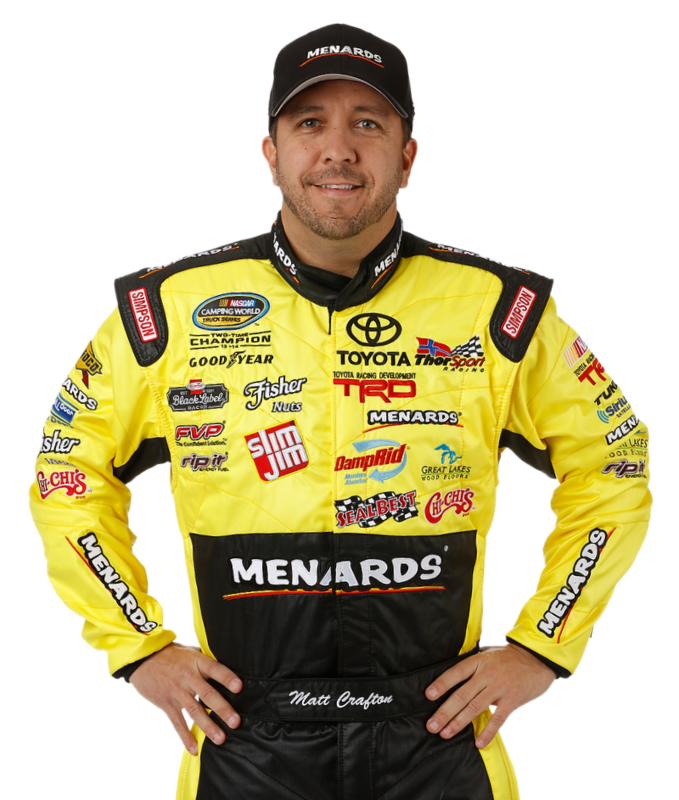 The Chase is On… Two-time NCWTS Champion, Matt Crafton is one of eight drivers to make the inaugural Chase, and is currently ranked second in the 2016 Chase standings after the first race in Round 1. Two races remain in Round 1, including Saturday’s 146-lap event. The top-six drivers from Round 1 will transfer to Round 2 of the Chase, which kicks off at Martinsville Speedway on October 29. In The Loop – 2016… According to NASCAR’s Loop Data statistics, Crafton ranks first in the following categories; Average Running Position (7.7), fastest driver early in a run, fastest driver late in a run, Fastest Laps Run (227), and Laps in the Top-15 (2105). The ThorSport Racing driver ranks second in Driver Rating (107.0), and Laps Led (425). Vegas Rewind – 2015 … The ThorSport Racing driver started on the pole, led the field three times for 69 laps, and finished eighth due to fuel mileage. Race Rewind – Loudon… Making his 14th NCWTS start at New Hampshire Motor Speedway (NHMS), Crafton started seventh, ran as high as second, and finished third in the 175-lap event. Major Milestone…The Tulare, California native extended the NCWTS record for consecutive starts to 378 in the UNOH 175 at NHMS passing four-time NCWTS champion Ron Hornaday, Jr with 360 starts in the 2015 NCWTS season finale at Homestead-Miami (Fla.) Speedway. Crafton made his series debut at Auto Club Speedway in November 2000, and enters his 16th full-time season in the NCWTS, and his 15th full-time season with ThorSport Racing in 2016.